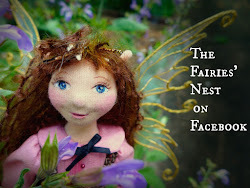 The Fairies Nest - OOAK Cloth Dolls & Fiber Fantasies: Welcome to the Nest! I've been nose to the grindstone the past week...I've always wondered about that phrase, how could a bloody nose possible infer hard work? but I digress...and I have lots of work in progress but nothing that's ready to show yet. So I thought that this week that I'd take you on a virtual tour of my studio. Ready? As you can see I tend to be ridiculously organized...except for work table which, despite last weeks excavations, is already starting to be lost under piles of fabric again. It's not there yet but I bet by the end of next week we'll be talking serious mess...okay maybe just serious for me the neat freak. I have added a couple more mice sets to the shop (and they're pretty darn cute) as I was able to carry them with me when we went out of town last weekend to celebrate my mom's 70th birthday. A delightful party was hosted by my sister, and my brothers actually managed not to set fire to anything, so a good time was had by all. (Seriously, the fire thing is an issue with them but we love them anyway.) 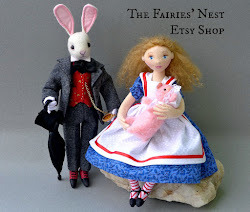 Hopefully I'll have some new dolls next week and a bit of news as well. See you then! eeee! 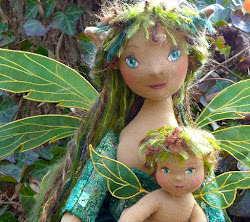 Look at all the little faeries waiting to be born!!! I love your work place, I am envious of its organization! Love the work space shot. You just reminded me that I have got to sort my fabrics. It's so nice to get a peek at your work space Cynthia. I see your job as a librarian has carried through to your home... wish mine looked tidy like this! love the peep into your magical workshop! Oh yes, like Cat said, I too love the wee peek into the inner world of your creative magical workshop! also wishing you and yours a very Happy Thanksgiving ! I am jealous of your room!!! love it!!!!! !